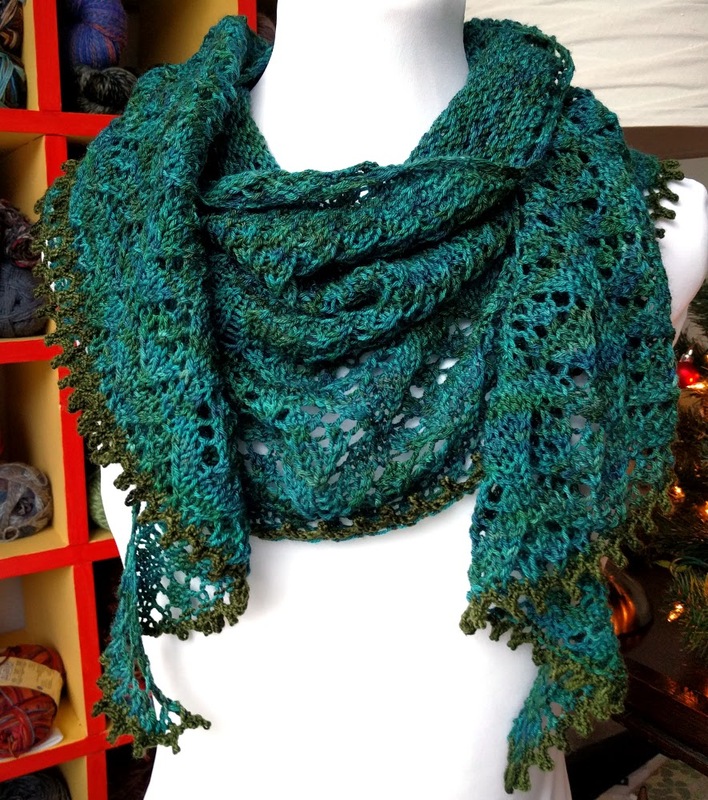 But the test for her new shawl pattern started back before Thanksgiving and had an extremely flexible deadline. I needed a relatively quick project for travel knitting, so I signed up to help with the testing. 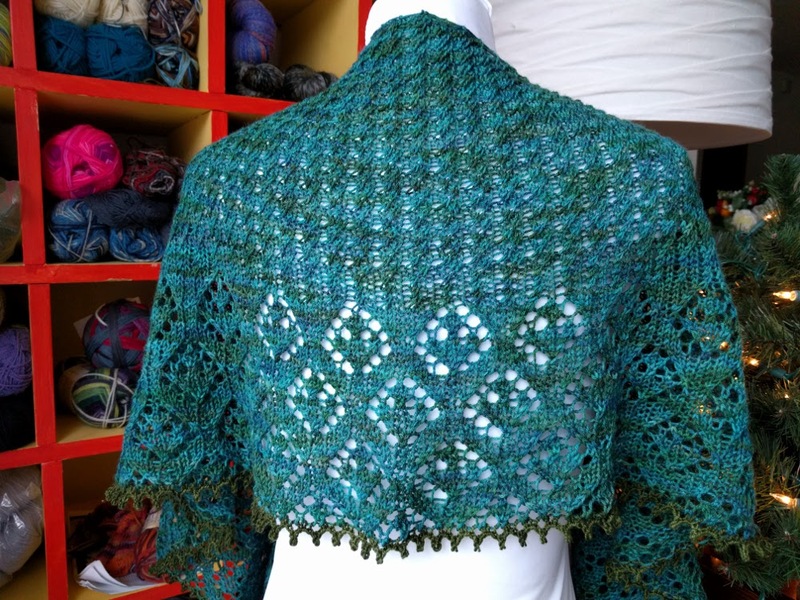 The textured body of the shawl is perfect for airplane and car knitting. Though I would set up some system for keeping track of which of the two texture rows you are working in the repeat – it’s very difficult to read your knitting to determine which one you should be doing, and you won’t be able to tell you’ve gotten it wrong until you’ve worked a couple more rows. Once I started using a counter to keep track, things went very smoothly and I was finished with the textured section much sooner than expected. This textured stitch has quickly become a new favorite. It looks like a small cabled stitch, but it is not. The look is achieved by working the stitches twice before sliding them off the left needle. So easy! The lace section is also very lovely. I needed some quiet space to work the first few rows to set up the lace pattern, then it was easy to read the stitches of the prior row to keep track of the current row’s repeats. Again, there is nothing hard in this lace section – it uses the typical suite of stitches found in most lace patterns – but it did require some concentration, which is in short supply during the holidays. 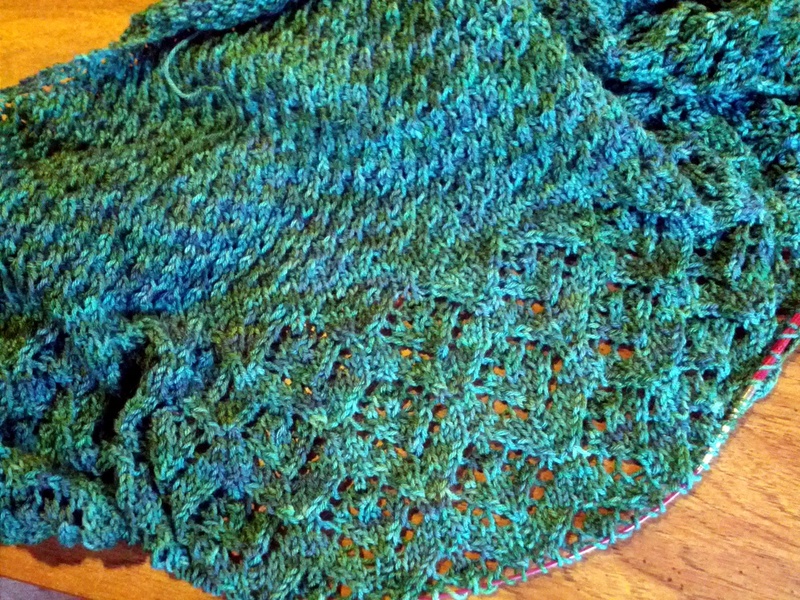 You’ll notice that the picot edging is worked in a different color. The pattern is flexible here; you can either work the edging in the same color as the body, or change the color at the last two rows. In my case I ran out of yarn about halfway through the next to last row and was forced to make the change. 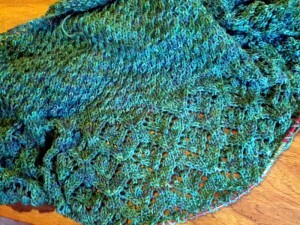 That was my fault – the designer estimated 450-500 yards, and I chose to work with a skein that only had 400 yards. 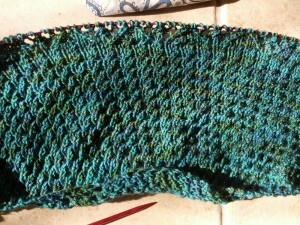 I’m not unhappy with the edging, but I think it would have been better in the original yarn. Overall this was a very happy project. 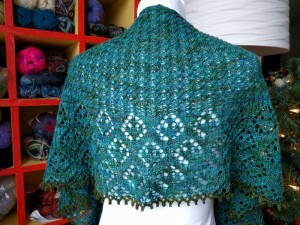 I love how the lace and textured sections opened up in blocking, and how they work so nicely together. This is another one where I wasn’t sure whether to keep it or gift it. However, it works so wonderfully with my wardrobe that I’m leaning toward keeping it. This entry was posted in Knitting and tagged blue, knitting, lace, shawl, wool. Bookmark the permalink.